Atlantic City, as historian and American Tourism contributor Bryant Simon has argued in Boardwalk of Dreams, built its reputation with iconic, lavish hotels and the promise that tourists could reinforce their middle-class identity by taking a rolling-chair ride on the famed Boardwalk. But Atlantic City, like other American cities that enjoyed their heyday in the first half of the 20th century, began to unravel as locals left densely packed front-porch neighborhoods for suburbia and tourists traded the World’s Playground for more exclusive emerging resorts. The arrival of legalized casino gambling in 1978 promised a resumption of Atlantic City’s glory days, but in recent years the newfound luster seemed to fade as nearby states introduced gaming alternatives and the gap between the casino district and a poverty-stricken city grew ever wider. Now, within two months, Atlantic City will celebrate the opening of Revel, a 47-story mega-resort that promises the latest revival of a struggling tourist city. 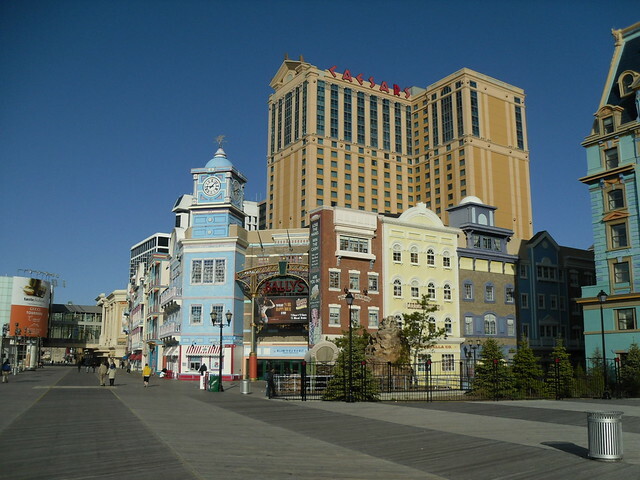 After construction stalled in 2010, the State of New Jersey launched a major bailout of the project and went a step further by creating a state-regulated tourism district to stabilize the shaky gambling trade. Everyone from New Jersey Governor Chris Christie to local rolling-chair concessions is pinning new hopes on a Revel revival of Atlantic City. As the Press of Atlantic City reported today, the governor hopes Atlantic City will be a linchpin in his “New Jersey Comeback,” while Royal Rolling Chair rolls out spruced-up chairs with pushers trained as tourism ambassadors.